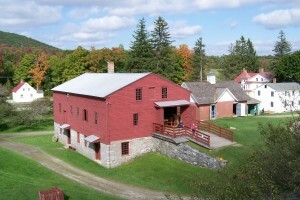 This building is likely the one shown on the 1820 map of Hancock Shaker Village as a Cider House. In 1835 it was enlarged to replace an earlier tannery and probably set on a one-story stone foundation. A date stone reading 1835 is set into the outside of the northeast corner foundation wall. In 1860 the Hancock Shakers’ tannery was valued at $3,128, and produced over 600 sides of leather, 200 calfskins, 400 kips (smaller hides), and 510 sheepskins. A windlass overhead raised heavy loads of tanned skins to the attic where they were dried and stored. 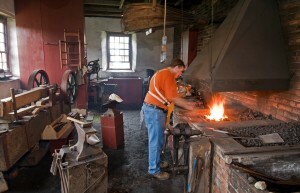 The restored blacksmith’s shop and forge in the tannery. By circa 1875, the Shakers were unable to compete with larger tanneries in the area and suspended their business. The tanning pits were filled in and the building was converted to a cider press and a forge was installed in the north end. During the twentieth century, the upper floors of the building were used as a carpenters shop. 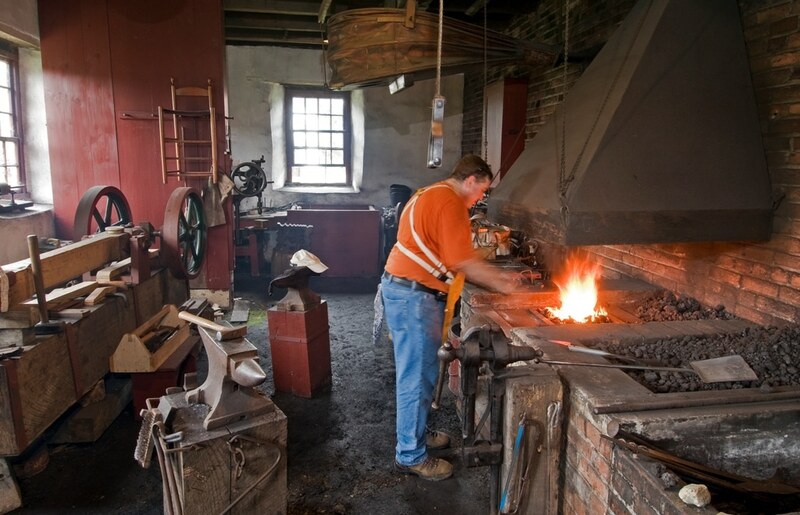 A variety of workshops, including Oval Box Making, are conducted in the main floor of the building, using traditional woodworking methods.